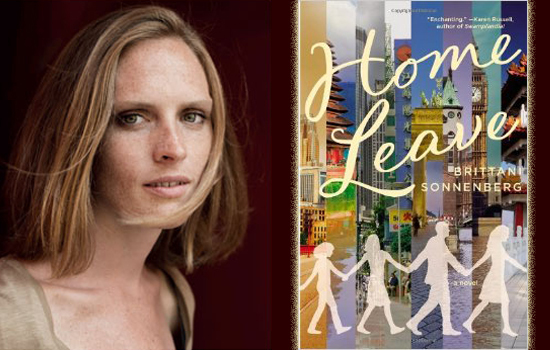 Brittani Sonnenberg’s first novel, Home Leave, was published on June 3 by Grand Central Publishing. It is the story of the peripatetic Kriegstein family (parents Chris and Elise and their daughters, 16-year-old Leah and 14-year-old Sophie) and their experiences living abroad in Hamburg, London, Shanghai, and Singapore. It is a complex exploration of the various relationships in this one small family, the nature of home, and the impact of a family tragedy on those left behind. Sonnenberg’s writing possesses a sophistication and insight that makes readers sit up and take notice. The opening chapter is as brilliant and clever a piece of writing as I’ve read in a long while (and will no doubt be widely anthologized, as it can stand on its own quite nicely). Sonnenberg studied English literature with a citation in Mandarin Chinese at Harvard University and earned an MFA from the University of Michigan. She lives in Berlin, where she is a frequent contributor to Berlin Stories on NPR. Her award-winning fiction has been published in magazines such as Ploughshares, anthologized in the O. Henry Short Story Prize Series, and received distinguished story recognition by Best American Short Stories. Her non-fiction has been published by Time Magazine, the Hairpin, the Associated Press, NPR, Minneapolis Star Tribune, and elsewhere. Home Leave appears to be autobiographical, at least in the sense that you lived in some of the places that are featured in the book. How do you decide which personal experiences to make use of in fiction? Do certain experiences seemingly make that decision for you? And how do you then decide how much to rework the truth into fiction? I think that’s exactly the way to describe how it felt to write Home Leave: certain autobiographical experiences seemed to clear their throats and step forward, demanding to be represented in the novel. At other times, I would be working on an utterly fictional passage, and a tiny autobiographical sliver would insert itself. Before I began the novel, I wrote a memoir that I ultimately put in the proverbial drawer: something wasn’t coming together with it. But I still had a deep urge to continue exploring the memoir’s material (an American family overseas, a sibling’s sudden death) in fiction. It didn’t feel like “reworking the truth” since the novel’s chapters, as they came to me, felt fresh in their fictional forms. But I suppose in some corner of my brain I was reworking the truth in a playful way, like a kid playing dress up, trying out different costumes and props. I lived in Honolulu from ages 10-12 and it had a profound effect on me (although it wasn’t a foreign country, it felt like one to me). What are your thoughts on living in a foreign country as a child? Do you think everyone should do that? I think it makes a lot of sense that living in Hawaii at such an impressionable time changed you deeply. I think living overseas as a child is both a privilege and a burden: you’re exposed to a profoundly different way of living and thinking and being, but it also jostles your notion of where home is and who you are. I recently conducted an interview with several writers who have settled overseas as adults, who all claimed that this “outsider status” as a foreigner can be crucial for writing and for gathering material. That said, I wouldn’t recommend it for everyone. We hear and read a lot about parents coping with the death of a child, how they never get over it, understandably. But what is that loss like for a sibling? We don’t hear nearly as much about the long-term effects within that relationship. It’s devastating for every family member, in different ways. For a sibling – at least for me – there was a lot of guilt about surviving my sister Blair, who was two years younger than me. And I felt horribly alone in the world without the sister that had shared so many worlds with me. I still ache from that missing, although now it’s a gentler throbbing than before. Have you always known you were going to write about a death in the family? Or did it impose itself on you while you were trying to write about other subjects? Several of my short stories involved the death of a loved one, but the novel was the first time I tried writing about the subject in a way that felt so “close to home.” It was difficult to write, but I felt the urge to deal directly with my family’s experience, rather than through an entirely fictionalized scenario. How long did you work on Home Leave? Did it come to you slowly over time or in a vision, as it were? Both. Home Leave took a long time to write, and it came out very quickly. As I mentioned earlier, I had worked on a memoir for a couple of years that I finally put aside. I started from scratch on a new fiction project that dealt with similar material, and ended up writing the novel in a little under two years. But the subject of a sibling’s death and an American family’s life overseas had been on my mind for many years, and one of the chapters is adapted from a short story I wrote in college. How many drafts did you write before you reached the published version? Who helped you produce the book as published, and what was their contribution? My agent, Jenni Ferrari Adler, and another reader, a close friend of mine, helped me to revise the first draft. Jenni sold the second (or perhaps it was the third?) draft to Grand Central. Several chapters then went through major revisions with my editor at GC, Helen Atsma, and even my German editor, Ulrike Ostermeyer at Arche Verlag, helped a great deal with the chapters set in Berlin and Hamburg. What experiences, as opposed to books, have shaped your perspective and voice as a writer? Living overseas, especially in Shanghai, was an enormous influence. I also think my Southern heritage (my mother is from Mississippi) has affected how I view storytelling and humor. And my sister’s death has forced me to think a lot about mourning, grief, love, and family, and prompted me to investigate these themes in my fiction. Are you part of any writers’ groups, for example a group of friends from your MFA days or organized writing groups? If so, what do they offer you as a writer? Yes, I am. I have a casual writing group in Berlin that helped me with several chapters from the novel. I also have friends from my MFA program who I turn to for help, not only with manuscripts, but also just with the daily frustrations and quandaries of being a writer. And I have a good friend in the US – a fantastic writer who works as a psychiatrist – who I often consult. Which of your stories would you recommend to someone who enjoyed Home Leave? Where can we find them? Do you have any plans for a story collection? Thanks for asking! My short story “Hong Kong Buffet,” about a Chinese restaurant in Mississippi, was just published by Readux Books (a wonderful small press in Berlin), and is available as an e-book and a paperback; and my short story “Taiping” (which won a 2008 O. Henry Award) can be found online. I don’t have any current plans to go out with a short story collection, but I’ll keep you posted! You are currently living in Berlin. Why did you decide to settle there? Is it a particularly good location for Americans? It seems as if it has become the new Paris for creative types. In some ways, my decision to settle in Berlin was something of a coincidence; I was looking for a break from the Midwest (after graduate school in Michigan) and happened to visit Berlin and fall in love with the city. I do think it’s a good location for Americans – there are a lot of us over there, especially from Brooklyn! – but one thing I truly value about Berlin is its cosmopolitanism. It draws creative types from all over the world and it’s energizing to see so many people who are so excited to be there. What is your writing routine (if you have one)? Where do you write? What five things do you need in order to write? I try to write for about three hours a day, usually in the morning. I read a wonderful article on establishing a writing routine by Ellen Sussman in Poets and Writers a few years back that I’ve adopted (somewhat) and that’s helped me stay (somewhat) focused. I write mostly at home, but I also have a shared office space with other writers in Berlin that I recently joined. Five things I need in order to write: a window, relative quiet, a laptop, courage, and coffee. What are your thoughts on the issue of gender bias in publishing (such as the issue of feminized cover art used on literary fiction by women and the imbalance of bylines and books reviewed)? Joyce Carol Oates recently noted that it seems unnecessary to have awards such as the Baileys Women’s Prize for Fiction when women are winning so many of the major awards (the Nobel Prize, the Pulitzer, the Booker, etc.). Do you agree or disagree? Do we really need things like the VIDA Count (and, for that matter, a blog like Read Her Like an Open Book)? This is a tough question. On the one hand, there is an objective disparity that needs to be addressed (and I feel like resources like VIDA and this blog call necessary attention to the issue). On the other hand, sometimes all the uproar drowns out the individual voices of the books and authors themselves. What everyone would prefer, of course, is a level playing field, but until we have that (and in order to get there), I think intermediary efforts are crucial. Which authors and books are your primary influences? What have you read recently that impressed you? Which authors and/or books deserve more attention? I recently read Other Voices, Other Rooms by Truman Capote and really loved it, especially the way he paints setting. I think Jane Gardam, a British writer, now 86, deserves more attention. She wrote a fantastic trilogy mostly set in Hong Kong, the first book of which is Old Filth. I also admire Amy Bloom’s short story collection A Blind Man Can See How Much I Love You. And I recently came across a poem (“Found to Be Borrowed from Some Material Appearance”) by Donna Stonecipher, a Berlin-based American poet, which I think is pretty brilliant. Previous What Are Some of Our Favorite Women Authors Reading This Summer?